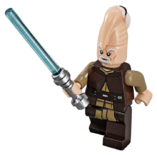 Ki-Adi-Mundi is a Star Wars minifigure based on the character of the same name from the Star Wars Movies. He was a member of an intelligent race of beings and a respected member of the Jedi Council and led Clone Troopers as a General in the Clone Wars. He was stationed on Mygeeto when Order 66 was issued, and was fired upon by Commander Bacara and Galactic Marines after receiving Palpatine's orders to kill the Jedi. He tried to defend himself, but fell to blaster fire. He appeared in a physical form for the first time in 7959 Geonosian Starfighter. In 7959 Geonosian Starfighter, he has an exclusive hairpiece which gives his head a larger appearance. The extension has the mould of hair on the back of it. He has a printed face which depicts a small beard, an old looking face, and green eyes. He wears a tan shirt, brown trousers and waistcoat, and a blue bladed lightsaber. There is also printing of wrinkles on the back of his head which continues onto his headpiece. Ki-Adi Mundi can be used as a playable character in all four LEGO Star Wars games. He first appeared in LEGO Star Wars: The Video Game (excluding the Gameboy version). He could be bought and then played as a playable character. He held a blue-bladed lightsaber and had an enlarged minifigure head. In LEGO Star Wars II: The Original Trilogy, he could be used as a playable character if a save from the first game was used and a cheat was selected. This could not be done on the Gameboy or the Xbox 360. Soon Ki-Adi Mundi would reappear as a buyable character in LEGO Star Wars: The Complete Saga, with a new design (brown clothes and cape). Ki-Adi-Mundi is an unlockable character in all the LEGO Star Wars games, yet he makes no appearance in any levels in the actual game. Ki-Adi Mundi is also featured in LEGO Star Wars III: The Clone Wars. 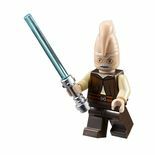 A cheat to unlock Ki-Adi Mundi in LEGO Star Wars: The Video Game was featured in a LEGO Magazine. This page was last edited on 9 April 2018, at 23:53.